Several weeks ago I was treated to a small-group tour of some of the highlights of the Smithsonian’s Museum of American Art. 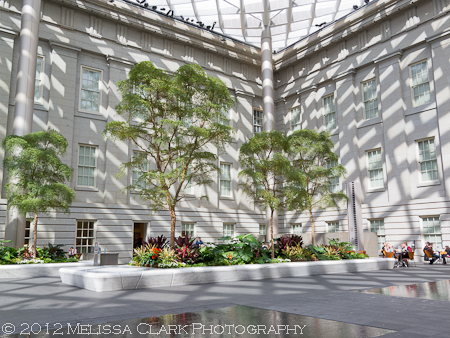 Before we began the tour, we took some time to admire the Arlene and Robert Kogod Courtyard that joins the MAA to its sister building, the National Portrait Gallery. I wasn’t unfamiliar with the space. Back in my days as a lawyer for the Justice Department, I would meet friends in the courtyard for lunch. But what a difference between then and now. Then it was open to the elements, with just some tables to serve people enjoying lunch brought in from the NPG Cafe – so it could be too hot, or too cold, to use year-round. And while the buildings themselves are beautiful, I often felt the space could use some dressing up. The Kogods must have heard me. Although technically the Courtyard isn’t a garden, but an interior gathering space, it has plantings (see below) and both its ‘floor’ and ‘ceiling’ spaces are something special. The ceiling, composed of countless glass and steel panels that undulate above the rooflines of the old buildings, supported by steel columns whose color matches the stone of the buildings almost perfectly. No two panels, it is said, are alike. 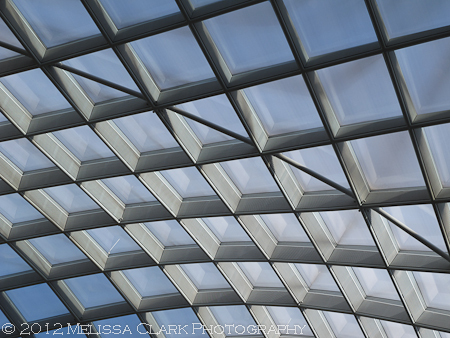 Individual “tiles” of the roof of the Kogod Courtyard at the Smithsonian’s Museum of American Art. The patterns of the tiles allow light to play on the walls of the courtyard, lighter or darker depending on how sunny it is outside. 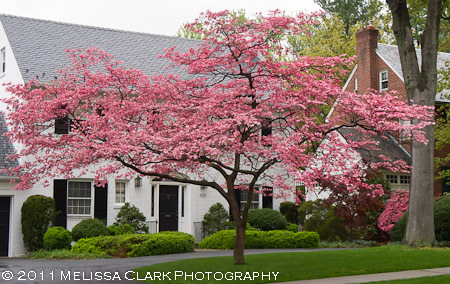 The ground plane and “understory” areas of this urban landscape – as it might be characterized – were designed by Kathryn Gustafson, a landscape architect renowned for her inclusion of original “water features” in unexpected settings. 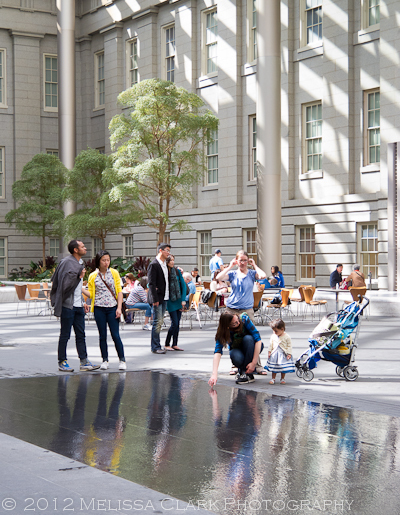 Here, in the Kogod Courtyard, there are several rectangular water scrims that can be turned off and on, providing the sheerest of areas for visitors to explore (as long as they don’t run through them, asks the museum’s literature describing the area). Sometimes the scrims are turned off for maintenance (or evening events), and they simply disappear. One of Gustafson’s quarter-inch deep water scrims invites visitors to explore. As for plantings, there are four large marble planters (also designed by Gustafson’s Seattle firm). The brochure at the Museum described them as containing two 32′ tall ficus trees (although I saw only one on my visit; perhaps the second one has not survived) and sixteen black olive trees, also called “shady ladies,” as well as a variety of ferns and tropical-looking plants. The planters are generously proportioned, inviting visitors to read or check e-mail while perched on the planters’ edges (the courtyard has a wireless connection). 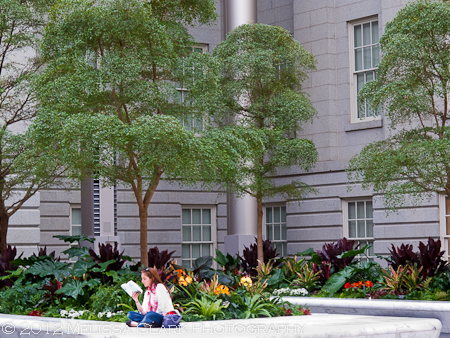 A Courtyard visitor enjoys a quiet place to read on the edge of one of the marble planters. In short, this place is a delight to visit. If you’re in the area, stop by – the Museum is open until 7 pm on many evenings (although you should check its website for updates). For more information about the design of the ceiling and the brilliant architect, Norman Foster, behind it, click here. 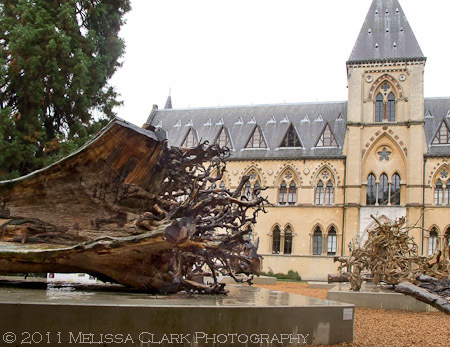 Wisteria – Wild or Wonderful? 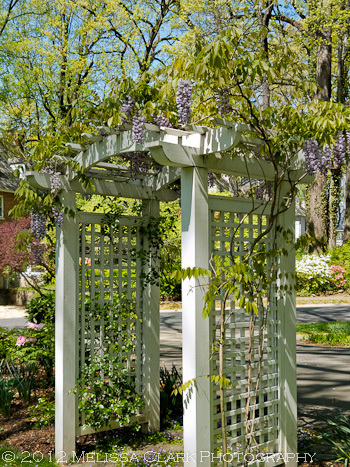 If I had to name the plant I am most often asked to include in a garden design by a potential client, it would have to be wisteria (Wisteria floribunda, or Japanese wisteria). Sometimes, they don’t even know its name, but describe it in longing terms as “that wonderful plant that has long purple-y flowers that hang down.” I’m sure what they envision is something like this. 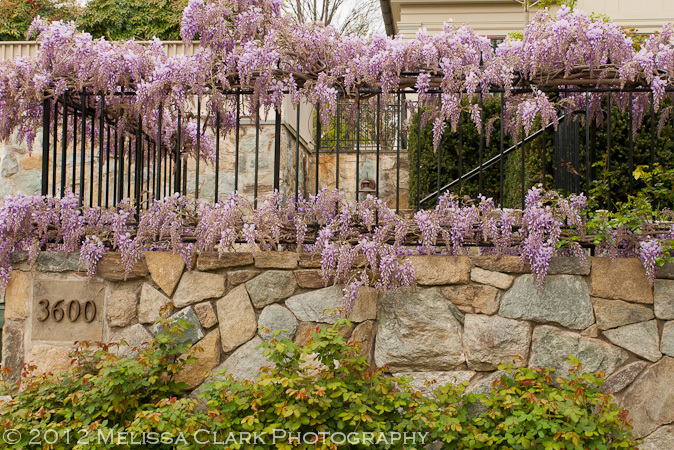 Wisteria trained on an ornamental iron fence in northwest Washington DC. 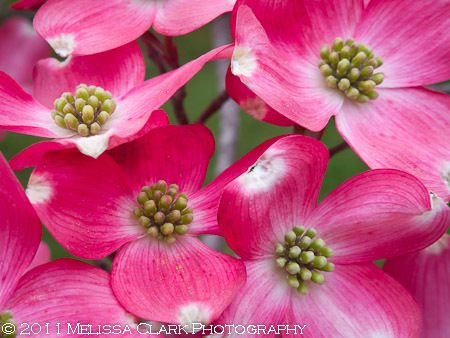 Now don’t get me wrong – I think this is an extraordinarily beautiful plant in bloom. 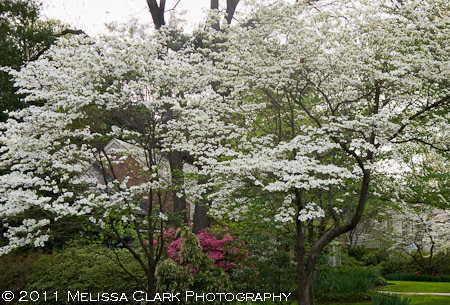 But I also believe that it only belongs in a garden IF (and this is a big “if”) the garden owner is prepared to support it properly, be prepared for a serious amount of maintenance work to keep it in check, and is OK with the fact that is potentially invasive – I saw it in masses when I visited Charleston in the spring in 2009, half-smothering live oaks, and even around here I see it weaving its way up tall trees on the edges of roadways. 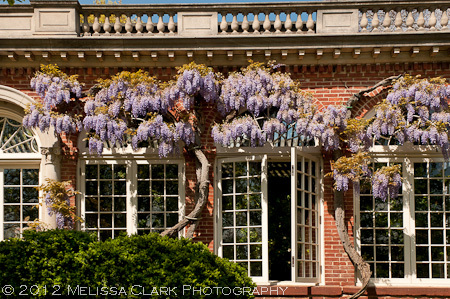 Wisteria was introduced to the United States in 1830. 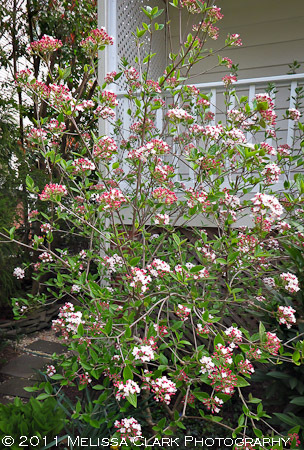 It prefers full sun but established stands of it will live and even flower in partial shade. 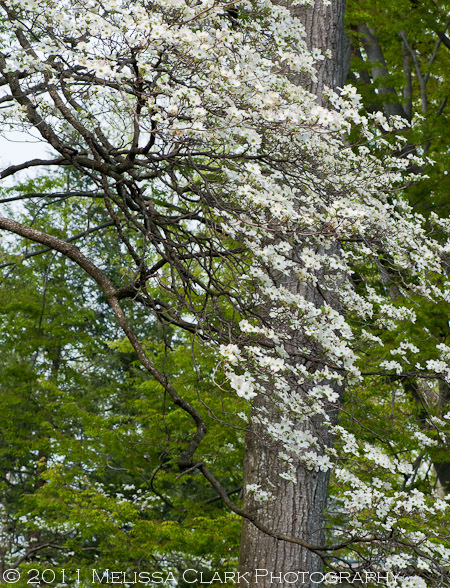 Here in DC, the most well-known stand of it in a public garden is probably at Dumbarton Oaks, where you can see it throughout the garden, although always carefully sited on structures that can support its weight. 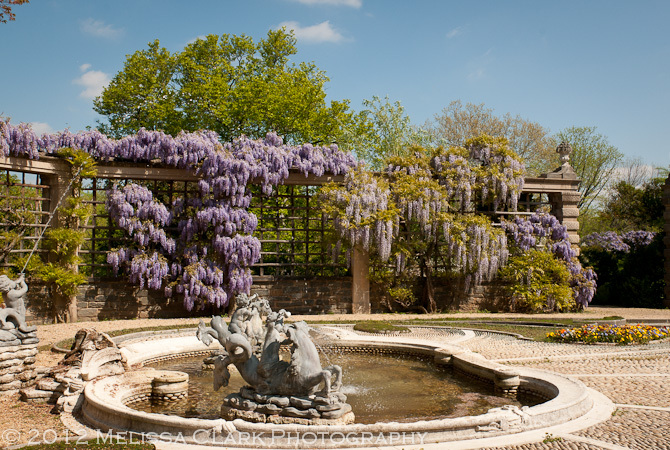 Wisteria supported by an arbor at Dumbarton Oaks' Arbor Terrace (with the Fountain Terrace in the foreground). 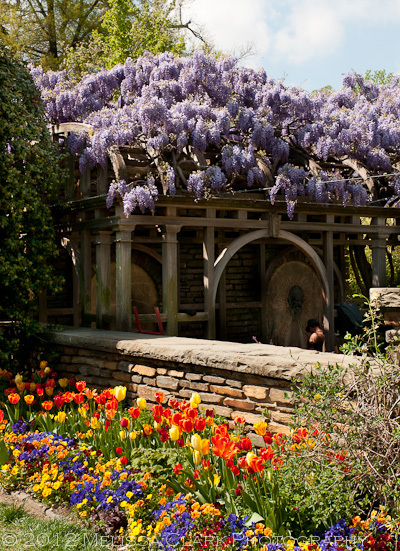 More blooming wisteria in the Pebble Terrace at Dumbarton Oaks. So, take a close look at this photo from the Orangerie at Dumbarton, one of the first buildings you see on entering the grounds there. 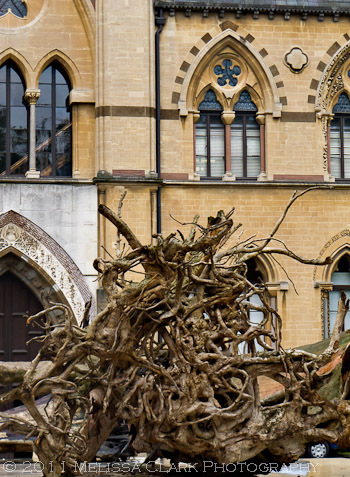 The trunks of these wisteria vines are attached to the brick front of the Orangerie with wires and strong rubber ring supports. Here’s the size the trunks can become over time. No wonder the gardeners here prune the wisteria three or four times during the growing season. 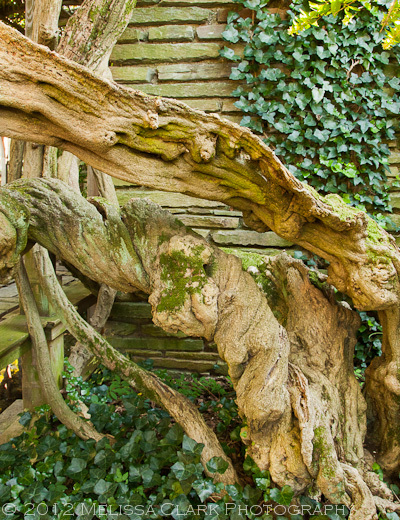 In the wild, wisteria trunks like this can attach to and ultimately strangle other trees. 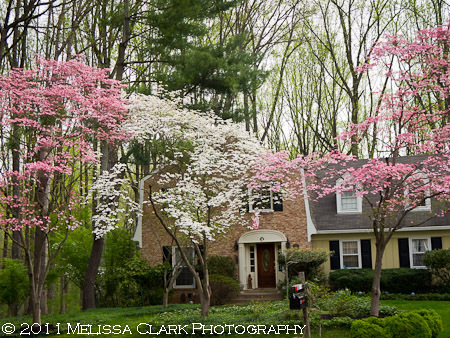 And if I find it wild in a garden I’m designing, I confess that I will do everything in my power to eliminate it (with the owner’s permission, of course). 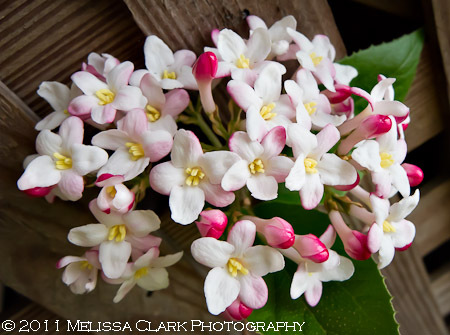 Still, its allure is strong enough that I have one client with a very shady garden who installed a wooden arbor just to support a volunteer, and this year (perhaps our mild winter helped), it has bloomed unusually well. 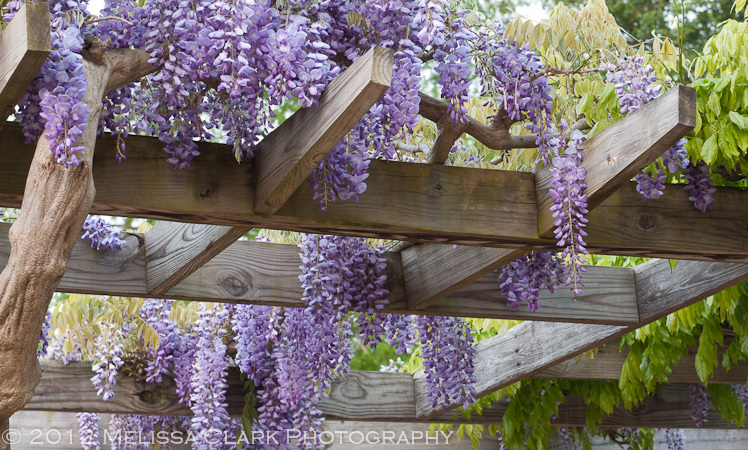 Wisteria blooming on an arbor in a small suburban garden in a shady back yard. What do you think? Do you love or hate this vine? Over the Fourth of July weekend, I found myself in the vicinity of the Blue Ridge Mountains of Virginia, spending time with a friend exploring little towns in Shenandoah County. We stumbled on a cute little store in Mt. Jackson, Virginia called Wetlands Trading Company. “Ponds, Carpentry, Landscaping,” reads their business card, and “Garden/Gift Shop, stone, Mulch, Pond Supplies.” In other words, something for everyone. 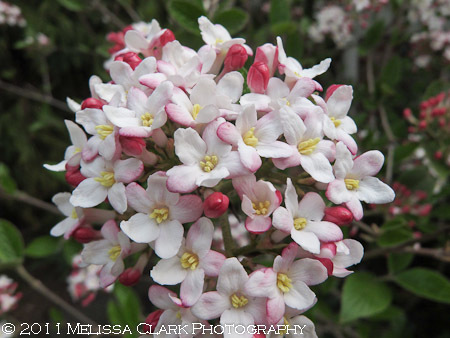 So this week, no in-depth look at plants, just some fun ideas you might like for your own garden. Enjoy! A tilted birdhouse and weathered peacock “sculpture” with Miscanthus in the outdoor area. Indoor mermaids and seahorses add more whimsy to the store. These eye-catching sun decorations come with blue or gold faces. Three rabbit figurines greeting visitors – one with crooked sunglasses. Sunglasses seemed to be a popular accessory for many of the wooden figures.